Due to work commitments, I’m missing another Annual Conference and keeping my fingers crossed that the dates for the next one fit better for me. As always, the photos and the tales from those attending are fantastic but you know that they only scratch the surface of the enthusiasm and buzz of the delegates. There are many resolutions that I will follow with interest and am gutted that I will miss Fringe events that look interesting and informative to my job in a primary school Nurture Room. I was also interested to see several information and training events published in the handbook that will also be beneficial to the party membership; I look forward to catching up with our local delegates for a blether about what was going on and getting my head around the new Constitution. This year, quite aside from the pertinent timing of conference due to continually developing Brexit news and Labour and Tory implosions, many of this year’s Glasgow visitors would have come straight from the simply incredible All Under One Banner March the day before in Edinburgh. With an unprecedented official attendance figure of “at least 100,000” marchers, the photos and videos have been extremely emotional to watch. This was another event that I did not manage to attend due to my children’s birthdays the same weekend but as I sat in the cafe of Inverness Ice Centre on Saturday afternoon incredulously watching the updating Facebook posts, I couldn’t help compare it to the recent Inverness march and the Edinburgh marches of old that I had attended and how they had felt big and optimistic. I cannot imagine the euphoria that must have enveloped Edinburgh on Saturday and how it would have galvanised marchers forward in their pursuit of independence. Perhaps I have missed it but I am not aware of the media downplaying this event like they have others in the past; perhaps the wheels are finally gaining momentum and they have jumped aboard with us; lets us hope that at last, the brakes cannot be applied in time and we are truly seeing the end result in sight. shared on their Facebook page this week, the reaction from supporters was, incomprehensibly, the Facebook scowling face. 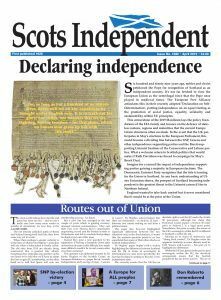 This blinkered approach that anything that the SNP proposes is “bad” and the lauding of all political opposition, indeed ANY political opposition as “good” can at times feel overwhelming but, as time goes on, it becomes more apparent that it is a few lone voices who are just shouting very loudly. In 2017, there was much being made of the return of a LibDem MP up here who would singlehandedly sort out all the ills of the constituency. Even his most fervent supporters must silently agree that although he has proclaimed often and, for some reason known only to himself, consistently raised devolved matters in Westminster, his track record in problem solving and indeed work, has been sadly lacking and I am confident that those who didn’t support the SNP at that election will not make the same decision in a few months time in the next snap election.